Beyond The File Cabinet: Cool Office Storage Solutions for Your Space! Tired of the those boring metal file cabinets taking up space in your office? It's time to modernize your space! While file cabinets will always play a vital role in the world document organization, cool alternatives are definitely available to boost your workplace appeal. In today's post we'll showcase 5 unique office storage solutions that will no doubt take your office interiors to the next level! Wether you're looking to get organized or simply up your office appeal, the Mayline Medina series low wall cabinet will do the trick! 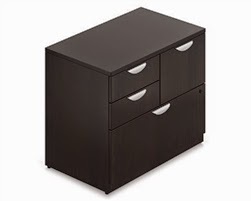 This affordable office storage solution priced at just $438.99 is available in 3 unique finish options including the popular gray steel variation pictured here. The MVLC low wall cabinet offers two laminate doors and two glass doors for the perfect blend of modern and traditional appeal. Outfitted with attractive silver handle pulls, this luxurious storage option is great for conference room, home, and executive office applications. When it comes to office storage, Offices To Go is not a brand you'll probably have pop into your mind. But they should! This innovative furniture and seating manufacturer takes pride in creating the versatile products you'll need to create fully functional work interiors built around efficiency and professionalism. 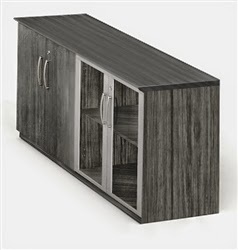 The SL3622MSF model mixed storage cabinet is a prime example of this awesome brands capabilities. Featuring a combination of organizing drawers and file storage space, the SL3622MSF provides the perfect alternative to the clunky metal file cabinets of the past. Available in 4 attractive finishes, you'll have no problem integrating the SL3622MSF into your space. 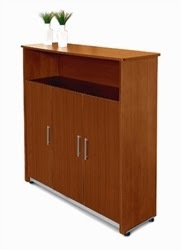 You'll be hard pressed to find a brand like OFM reliant upon traditional file cabinets for office organizing. This cutting edge manufacturer is always ahead of the office design curve and regularly sets trends that make the industry what it is today. Their 55116 model Venice series executive storage cabinet offers a modernized approach to office organizing in two different finish options. Priced at $880.99, the Venice cabinet is a bit more pricey than the average file cabinet but looks far more stunning in the workplace. The 55116 requires no tools for assembly, leaving those afraid of installation with nothing to fear. Pair the Venice cabinet with a wide range of complimenting desks and workstations to create a fully functional and well organized interior designed for your modern business mindset. Next up, the 9100 series personal storage tower from our friends at Global Total Office. For those looking to maintain the durability of metal in the workplace without the lacking appeal of traditional file cabinets, the 9100 provides the perfect solution. This versatile tower features a wardrobe section designed to keep your jackets, umbrellas, and hats off the desk and out of the way. Outfitted with a multiple file drawers and additional storage sections, the 9100 series storage tower truly does it all. Global offers all of their 9100 series storage products in a variety of cool paint finishes to avoid those bland taupe tones we've all seen a bit too much of. This is one metal organizing solution that's far from the ordinary! Last but certainly not least, desk side pedestals like those from Mayline's e5 collection have become the way of the future. 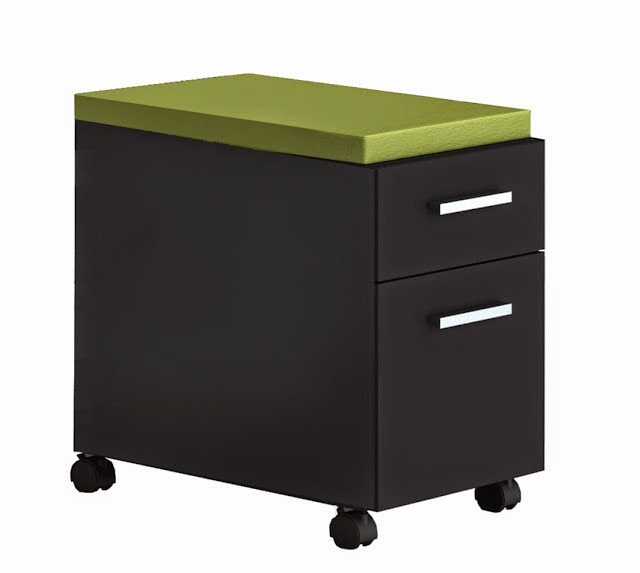 Outfitted with comfy cushion tops, these units act as a small guest stool and storage container all in one. Cushioned pedestals have played a major part in the booming trend of office designers looking to utilize product for multiple purposes. As space is always at a premium around the office, these mobile units can be situated wherever is convenient and pulled out when needed. While guest chairs are always nice to have on hand for office visitors, cushioned pedestals provide that extra seat your space is lacking when you always seem to need it. Mayline's e5 pedestals can be purchased individually or in preconfigured desk packages at a discounted price. Rest assured these trending storage solutions are cool, comfy, and downright versatile!